Ireland have to beat Thailand on Saturday to maintain hopes of making the Women's World Cup Qualifier Super Six after a 125-run defeat by India. The Irish have won only one of their three Group A games with the top three of the five teams progressing. Tournament favourites India posted 250-2 in Colombo on Friday with Thirush Kamini hitting an unbeaten 113. Ireland were bowled out for just 125 in 49.1 overs, Gaby Lewis top scoring on 33 while Isobel Joyce added 31. Joyce and Kim Garth each took a wicket but the Irish bowlers struggled as India piled on the runs. Kamini and Deepti Sharma put on an opening stand of 174 at the P Sara Oval to set up a formidable target for the Irish. Ireland were 4-2 and 15-3 as wickets tumbled, with Laura Delany (21) and Amy Kenealy (20) the only other players to make double figures. Poonam Yadav took 3-30 as group leaders India made it three wins from three games and book their place n the Super Six. 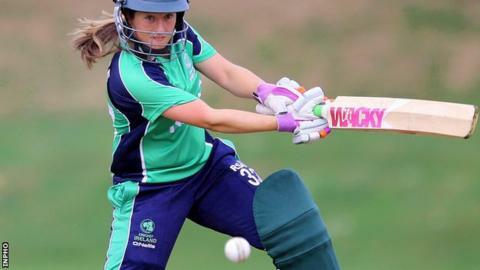 Ireland beat Zimbabwe in their opener before a 146-run defeat by hosts Sri Lanka on Wednesday. "India are a very strong side and they played good cricket throughout," said Ireland coach Aaron Hamilton. "We struggled at the start of our batting, as we did against Sri Lanka. We hit the fielders a lot and I thought we could have been braver and taken on their bowling more and hit over the top." In Friday's other Group A game, Zimbabwe beat Thailand by 36 runs to leave Sri Lanka, Zimbabwe and Ireland on four points apiece, but with Ireland having played a game more. In Group B, Scotland are on the brink of elimination after losing to Bangladesh by seven wickets, while Papua New Guinea were thrashed by Pakistan after being bowled out for 40. The top four from the Super Six stage qualify for the World Cup, which takes place in England this summer.